Seeking to calm growing criticism about his administration&apos;s handling of police misconduct cases, Mayor Rahm Emanuel says he will appoint a new "police accountability task force." In a press release, the mayor&apos;s office said the task force "will review the system of accountability, training and oversight that is currently in place for Chicago&apos;s police officers." Emanuel announced at a news conference Tuesday that he has dismissed Superintendent Garry McCarthy, who only days ago insisted to reporters that the mayor had his "back." Chicago Mayor Rahm Emanuel announced Chief of Detectives John Escalante will oversee the police department until a permanent replacement is found for the superintendent. 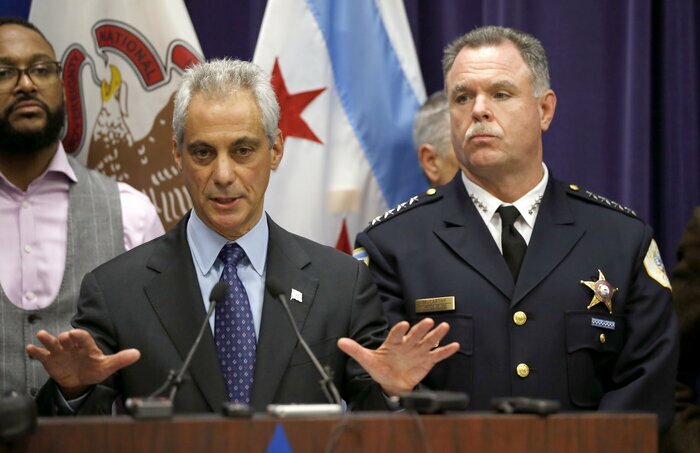 Emanuel praised the leadership of outgoing police Superintendent Garry McCarthy. But he called it an "undeniable fact" that the public&apos;s trust in the police has been eroded after a public outcry over the handling of the case of a black teenager shot 16 times by a white police officer. Of course, this comes about a week after a court order forced the city to release a video showing the police shooting death of 17-year-old Laquan McDonald. The black teenager was gunned down on Oct. 20, 2014. The video shows Officer Jason Van Dyke shoot McDonald 16 times shortly after Van Dyke stepped out of his vehicle. Right before the video&apos;s release on Nov. 24, prosecutors announced they would charge Van Dyke with first-degree murder. Since then, protesters have taken to the streets, and many people — including the editorial board of the Chicago Sun-Times — have called on McCarthy to quit or for Emanuel to fire him. Others have asked for Emanuel&apos;s resignation, accusing the city of attempting to cover up the shooting by trying to block the video&apos;s release for about a year. Emanuel defended McCarthy&apos;s tenure, saying that he had brought crime rates down using community policing tactics. Still, the mayor said, a police chief is only as "effective as the trust that the community" places in him. "Now is the time for fresh eyes and new leadership," Emanuel said. He added that his administration had opposed the release of the video to ensure the integrity of the investigation into the incident. Emanuel was asked if he had been trying to block the release so that it wouldn&apos;t hurt his bid for re-election ahead of the vote last spring. "I said a long time ago that upon the completion of the investigation, the video would be released," Emanuel said. The video, he said, was released hours after the investigation was completed and charges were filed. The mayor said federal authorities were looking into the McDonald&apos;s shooting and so would this new task force.